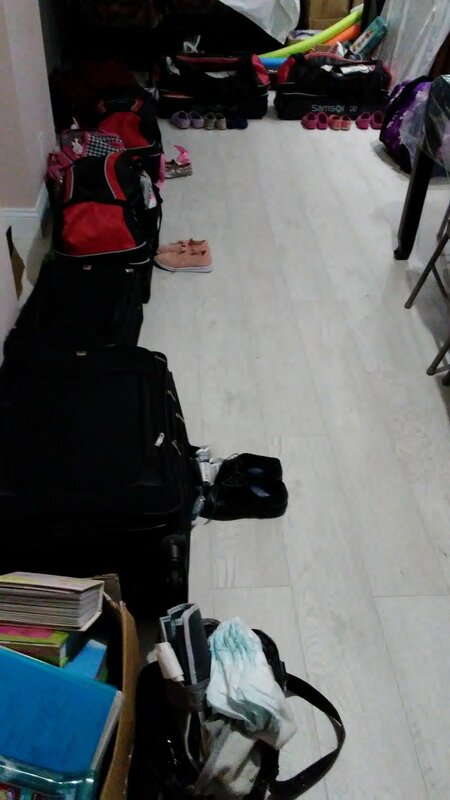 Right now I am looking at 12 open suitcases scattered around my in-laws' condo. Since we moved out of our house about two and half weeks ago, we have been living out of our suitcases and a few boxes of food. We are very fortunate to have such generous parents that have allowed us to take over their homes until we make our big move. It has not been easy, though. The kids and I have been commuting about 40 minutes to school each morning and have been to three separate houses for each of the past three shabbatot. To say that we are unsettled would be an understatement. To add to the chaos, we have attended two family weddings, an aufruf and a sheva brachot all in the past two weeks. It has made bedtime almost non-existent. I have to say, I think we are all doing pretty well considering the circumstances. We are trying to maintain as much normalcy as possible during this crazy time. Every morning, we go over the "plan" for the next day and discuss where we are going and what we are doing there. This phase in our lives proves to me that as a family, we are able to go with the flow and adapt to new circumstances. It gives me confidence that we will be able to flourish during this next big transition in our lives. Interspersed into our family simchas have been goodbye parties and last shabbat meals with friends. It has been extremely emotional to say goodbye to our dear friends. One of the hardest parts of this move is watching my girls play with their respective best friends and knowing that we will be pulling them apart in just a few more days. We plan whatsapp chats and facetime, but as my daughter expressed, it won't be the same. I know they will make new friends, and grow closer with the ones that are moving with us, but it doesn't make the goodbye any easier. I actually feel blessed that we are able to do this move in stages. First packing up and sending our belongings to storage, then selling our house, next finishing school, saying goodbye to friends and moving out of New Jersey, then eventually boarding the plane for aliyah. Since we are taking small steps, we are able to adjust to the new realities slowly. Selling and moving out of our house was one of those new realities. My kids love to drive by the "old house" to see if it still looks the same. Many mornings on the way to school, we take a small detour and drive down our old block and wave to our old address. The grass looks a bit taller and there is a new welcome mat at the door, but other than that it looks the same from the outside. Last week, my daughter noted that it will be strange not to know her address. We have worked hard to make sure all three girls know their address in case of an emergency. We have practiced it many times. To ease her worry, I shared our new address with the girls. I recited the street name and number, and as I got to the city, I said: Yerushalayim. Chills ran through my body. Our new address would be in Yersuhalayim and it hit me yet again, we are really coming home!